David has been a professional actor for more than thirty years, playing a wide range of characters in theatre, and on television and radio. After studying Law and English at Cambridge University, where he became Vice-President of the Footlights, he taught for two years before joining the company at Salisbury Playhouse. Since then he has played leading parts in theatres up and down the country; his stage work includes Kent in Shakespeare's King Lear (Ludlow Festival), Frosch in Johann Straus' Die Fledermaus (English Touring Opera), Lionel Espy in David Hare’s Racing Demon and, most recently, Canon Chasuble in The Importance of Being Earnest by Oscar Wilde (Middleground Theatre Company). David's London appearances include two seasons at the Open Air Theatre, Regent’s Park and many productions at the Orange Tree Theatre including Fanny Burney's The Woman Hater (playing Old Waverley) and De Monfort by Joanne Baillie (playing Jerome) (left-hand photo). In Farnham (farnhamrep) David played Mr. Sleary in Charles Dickens’ Hard Times and Eddie Loomis in Quartermaine’s Terms by Simon Gray (photo top right). Later, David played King Lear in Basest Beggars and Puck in Benjamin Britten’s A Midsummer Night’s Dream (both were non-singing roles) for English Touring Opera. David played the psychiatrist, Dr Kreuzer, in Graham Greene’s, The Potting Shed at the Finborough Theatre, London. 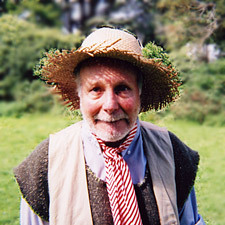 Later, David played a variety of characters in Dylan Thomas' Under Milk Wood for Farnham Rep. He returned to the Finborough to play George Bernard Shaw in Portraits by William Douglas Home. David played Perkins in The Conquering Hero by Allan Monkhouse at the Orange Tree Theatre, Richmond and revived his one-man show about William Cowper, The Castaway , in Cowper's home town of Olney. David again toured in Oscar Wilde's The Importance of Being Earnest , playing Canon Chasuble. David played Grandpa Joe in Grandpa Joe's Giant Storytelling Bed at the South Bank Centre, London. In June, David played 15 parts in a stage adaptation of Caryl Churchill's The After-Dinner Joke at the Orange Tree Theatre, Richmond. In September, David played The General in The Flouers o'Edinburgh by Robert McLellan at the Finborough Theatre, London. David played Montague in Romeo and Juliet at the Singapore Repertory Theatre. David played the lead in the award-winning short film Cicatrix (directed by David Beauchamp) and, on stage, he played Willie Gregson in A Day by the Sea (N.C.Hunter) at Southwark Playhouse. On television he is best known for playing Davros in Dr Who (BBC) and Simpkins, the pathologist in A Touch of Frost (ITV). He has also appeared in many comedy shows such as Terry and June and The Les Dawson Show and numerous other programmes and series including Tenko , Mapp and Lucia , Bergerac , Rumpole of the Bailey , Lovejoy , and most recently Footballers' Wives , Mr Sloane and Cuffs. 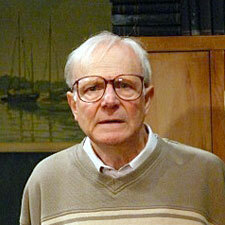 He has twice been a member of the BBC Radio Drama Company and made over four hundred broadcasts. They include many leading parts and unusual cameos such as Tidy, the Computer in Earthsearch and the barman in the The Hitch-hiker’s Guide to the Galaxy plus comedy shows with David Jason, Kenneth Williams, Roy Hudd and the Dad’s Army team.